The meeting in Manila took place from Wednesday 3 to Sunday 7 February 2010. 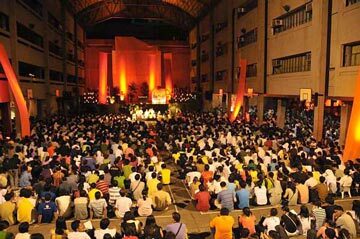 This was the 5th Asian young adult meeting, a stage in the “pilgrimage of trust” on earth led by the Taizé Community. 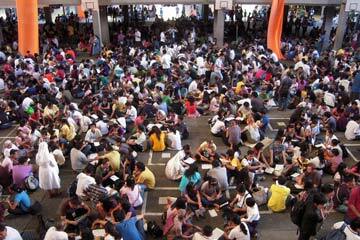 The greater part of the young people came from the different regions of the Philippines. With the participation of the numerous host families, the meeting brought together some 6 000 people. 500 of them came from other Asian countries and 200 from Europe and America, and from different denominations. The participants, aged between 16 and 35 years of age, were received in 77 parish welcome centres; Catholic parishes and some non-catholic parishes took part in this welcome. From there the young people went to families, “foster homes”, where they stayed throughout the meeting. Three times of prayer each day and meetings in small groups around themes from the “Letter from China” written by Brother Alois were the main elements of the program. Each evening during the prayer, Brother Alois gave a meditation. At 10.00am on Sunday 7 February, Cardinal G. Rosales, Archbishop of Manila, presided at a Celebration of the Eucharist. The meeting in the Philippines was prepared in close collaboration with the ECY-NSYA Episcopal Commission on Youth - National Secretariat for Youth Apostolate. Catherine is a medical student from England. At present, she is in Manila doing an internship with the World Health Organisation’s child survival department. Each day of the Manila meeting, she sent news of the day’s happenings. Frère Roger visited ’Smokey Mountain’ in 1991. A mountain of Manila’s waste, steaming in the Sunday morning heat. A mountain so tall and so wide that from the top we can see across the cranes of the port to the blue horizon of Manila Bay beyond. And at the foot of this mountain, a small wooden church is filled with children and young people, singing. "Sapagmamahal", they sing together, "Naroroon ang Diyos". Where there is love, there God is. And then silence. What silence! Broken only by cockerels crowing and the sound of distant traffic. The young people on the Taizé preparation team are welcomed here so joyfully, so generously. And later this week pilgrims from other parts of the Philippines and beyond will also be welcomed in this parish of The Risen Christ, Smokey Mountain. Well, there is certainly love here. Sapagmamahal, Naroroon ang Diyos. And further south, cradled in the urban bustle of Manila, our little preparation room at Don Bosco Technical Institute seems to shrink as the team of brothers, sisters and volunteers grows each day. There is energy in the air; people moving, preparing, singing, sharing. Signs are being painted ready to welcome people in the beautiful ancient calligraphy of many Asian scripts. Children play basketball in occasional spaces between the buildings. 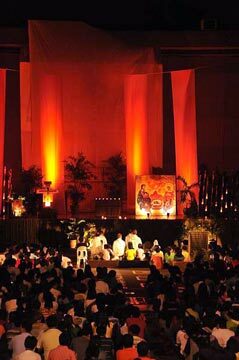 One such basketball court, our vast church space, is being decorated with three kinds of Filipino bamboo, standing tall like organ pipes, green with new life. Here in the Philippines, bamboo is a symbol of unity - how can one stem stand alone? This weekend brought the feast of Don Bosco, and the compound here has been throbbing with music and celebration. 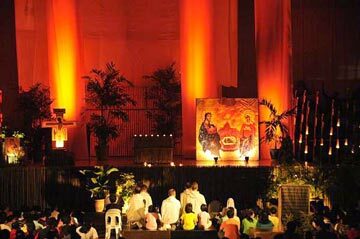 We remember how it was also a Don Bosco school who welcomed the Taizé meeting in Kolkata in 2006; Don Bosco, whose commitment was to ’journeying with the young’. Perhaps that is why we are here too. And on Wednesday we look forward to many more joining us on this journey, this Pilgrimage of Trust on Earth. Today we welcome and are welcomed. And with such joy! 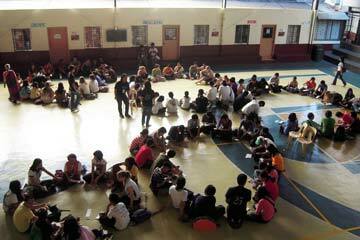 Groups of young people sit together, faces from all over Asia and beyond, resting after long journeys. The young Filipinos who offer us their city take every opportunity to greet, to share, to guide, to welcome. Our meeting place is a quiet green haven amidst the towers and building sites of the city; the mango trees and bougainvillea offering their cool shade to those weary from travel. And some have travelled so far. We have welcomed groups from all corners of Asia, from Viet Nam, from Bangladesh, from Japan, Indonesia, East Timor. From other continents - Lithuania, Canada, Kenya. 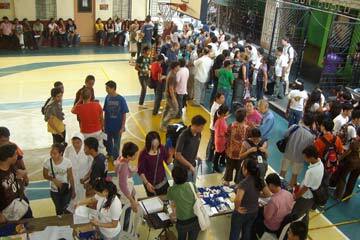 Others have come from the many Philippine Islands, from Luzon, from the Visayas. Even the journey across Manila took many hours for some. We are especially happy to welcome groups travelling from the southern island of Mindanao, Muslim and Christian friends together. Many international pilgrims returned to Manila today from a ’pre-meeting stay’ in other parts of the country. One, from Sweden, spoke warmly of staying with a farming community on the island of Negros, and of being welcomed so openly that soon she was joining the harvest of sugar cane and bananas. In the golden light of the late afternoon, music from the song practice echoes around our prayer space, now decorated with many large printed icons; we can smell bread being baked ready for tomorrow in a small bakery run by young people who have moved to Manila to work; impromptu games are being played on the football field next door; we gather for a simple supper of chicken and rice; and then we pray. A young volunteer from Hong Kong shares: "We’ve been waiting for this moment for so long, and today has been so exhausting, but then as I sat down to pray this evening, I looked at all these people sitting with me and I realised - today has been so beautiful". At the heart of the meeting are the prayers, a heart which beats the rhythm of the day, just as it did in Poznan, just as it will do in Porto next week, just as it does each day in many homes around the world. The first takes place in our local communities, the seventy-seven parish welcome centres which have opened their doors to pilgrims. And then, from all over this vast, diverse city, we gather, led by teams of volunteers who appear, somehow, and guide us from train to bus, from jeepney to jeepney. The ringing of the bells from the hill in France leads us towards our prayer space, ‘the dome’, where swathes of fabric billow in the cool breeze. “O halina, halina, Diyos Espiritu Santo”, we sing, accompanied by guitars, flute and violin; O come, come, Holy Spirit. And such gusts of wind surround us! The songs we sing seem to tell of a thirst within us: “Diyos ang bukal ng buhay”, Lord, you are living water; “Kaluluwa ko’y nauuhaw sa ‘Yo”, my soul yearns for you in the night. And then the floating melody of a Filipino song, a response perhaps, “Ang Panginoon ang aking pastol, pinagiginhawa akong lubos”, the Lord is my shepherd, he refreshes me to the fullest. Here in the Philippines, religion is visible everywhere – painted on buses, Christmas decorations still adorning many streets. But rather than being tokens, perhaps these are signs of a deeper faith, of a longing, a thirst, which is so central to many lives here. We are reminded of how Frère Roger “admired the gifts of young Filipinos. He told them how much he appreciated in them a heartfelt trust, trust in the living God.’ This afternoon we are invited to share in small groups. One young girl from Mindanao tells us: “In 2008 we saw conflict very close to home, many homes were burned and people killed. So we thirst for peace; we have decided to be peacemakers in our school and in our community. It takes a lot of courage, and sometimes we despair, but we hold on to hope”. Perhaps on a greater scale than on other continents, people in Asia live alongside those from different religious traditions, and from this collective experience comes a richness of wisdom. This afternoon we are invited to workshops, to be nourished by this wisdom and to share. In one, young Muslims and Christians from Mindanao share their experiences of how dialogue between people of different faiths builds a road to peace. In another space, young people affected by addiction tell of a farming community where they are welcomed; others hear from those working with refugees, and with the very poor. In so many there is a longing to be closer to other human beings, to open our lives to ’the other’. Another group reflects on how the Holy Spirit is given to all people, all classes, tribes, islands, religions. Sitting with our sweet ’merienda’ snacks in the warmth of the afternoon sun, we talk about our fears. We are from from Pakistan, from the Democratic Republic of Congo, from many different Philippine islands. A young woman from Viet Nam speaks of "being in touch with our deepest desires, our inner freedom to move with the Holy Spirit". How much we already share! We are led to share further here by the deep, abundant welcome we receive from families whose trust leads them to open their homes. One Swiss pilgrim speaks of a moment of prayer shared late one evening on the roof of their home, singing together. We are welcomed across divisions, without question. A German girl wears a necklace given by a new Filipino friend; a volunteer from the Philippines carries with her a pot of red chilli paste brought by a Korean visitor. In Filipino churches we hold hands as we sing "Ama Namin", Our Father. Each evening this week we are invited to pray together around the cross, to express our burdens, perhaps, and those of the world. We hear prayers in the diverse languages of the Asian continent. The church is lit by torches, the cross supported by structures of bamboo – once again that symbol of unity. As Frère Alois said earlier this week, "It is God who unites us". Speaking of his life at home, one young boy from Mindanao explains: "We live as two cultures apart. We need to build bridges, simply because it is so hard to live with division". We reflect on the Spirit as a bridge across which we can walk to the other side. A woman from Ecuador shares how earlier today she saw a man selling fish which he had caught in the river, and she realised how much our cultures share. How many bridges already exist. of a deeper hope, of mercy. their homes. What colour, what life, what joy is given and received! of generous solidarity, of a deeper hope, of mercy. for the next step, nourished by all we have shared. words of Isaiah where God says: ’My ways are not your ways’." with the conviction that we are many parts of one body." springs of peace, of sharing, of mercy.